Xi Jinping emerged from his recent US visit with no meaningful new constraints on the development, deployment, and use of China’s military. Constructively, as part of a larger UN support package, he unveiled a Chinese plan to establish a police squad and 8,000 standby troops for UN Peacekeeping. Despite an ambiguous statement of intent to respect international law and not “militarize” features in the South China Sea, Xi underscored China’s sovereignty claims and insisted on its right to uphold them. There was no agreement on military cyber operations. There were two military agreements, concerning rules for aircraft encounters and a crisis hotline, but it remains to be seen how these will be implemented in practice. Xi doubtless felt strengthened by preceding developments, including those showcased in the military parade over which he presided on September 3. There he ushered down Chang-an Avenue a procession of advanced weapons systems, including no fewer than 32 anti-ship ballistic missiles (ASBMs) of two types, the world’s only such weapons. This pageantry displayed concretely what Xi has emphasized from the start: central to his “China Dream” of national rejuvenation through realizing a “Strong Country Dream” of great power strength is a “China Military Dream.”1 With economic growth increasingly uncertain, to shore up domestic support Xi is likely to emphasize this external component of his “China Dream” still further. 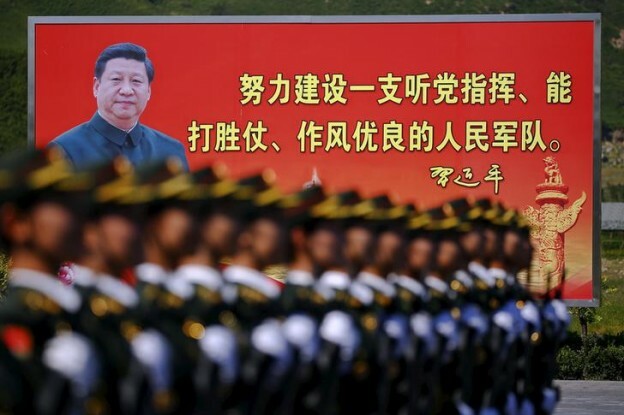 Though burdened with these political imperatives, Xi’s military vision is no pipedream. He is a man of big ideas and bold implementation. Beyond his confident princeling extroversion, Xi differs markedly from Hu Jintao, and even Jiang Zemin to some extent, in career path. Serving as secretary to Defense Minister Geng Biao gave him familiarity and comfort with the People’s Liberation Army (PLA) that both lacked.2 Even more importantly, twenty-five years of executive experience with ultimate responsibility for important decisions made Xi capable of imposing his will as needed.3 Displaying his overall leadership approach, Xi is pursuing ambitious goals, policy emphasis, resource allocations, displays of progress to further public support, and restructuring to ensure the requisite institutional foundation. This article uses the occasion of Xi’s US visit to analyze his impact on, and likely legacy for, China’s military development. In keeping with the visit’s bilateral nature, as well as Xi’s prioritization of preparation for scenarios of greatest concern, the article focuses primarily on PLA development to support the most likely major challenges it faces: demonstrating capability to address contingencies involving China’s unresolved island and maritime claims in the “Near Seas” (Yellow, East China, and South China seas). Encouragingly, as part of a larger pledge to increase UN funding and provide military assistance to the African Union, Xi announced that “China will join the new UN Peacekeeping Capability Readiness System and has thus decided to take the lead in setting up a permanent peacekeeping police squad and build a peacekeeping standby force of 8,000 troops.”4 In the White House joint press conference, Xi stated: “We’re committed to respecting and upholding the freedom of navigation and overflight that countries enjoy according to international law. Relevant construction activities that China are undertaking in the [Spratly] Islands do not target or impact any country, and China does not intend to pursue militarization.”5 But he also affirmed: “Islands in the South China Sea, since ancient times, are China’s territory. We have the right to uphold our own territorial sovereignty and lawful and legitimate maritime rights and interests.”6 It is possible to imagine Xi interpreting “militarization” selectively, or reserving the right to change course if he objects to US actions. Equally significant was the 300,000-troop reduction Xi announced in his speech immediately preceding the procession. No peace dividend, this downsizing is designed to make the PLA, literally, leaner and meaner. PLAN analyst Li Jie describes it as part of Xi’s “ambitious plans on how to transform the PLA into a real modern army capable of winning wars.”17 Outlined in the Third Plenum “Decision to Deepen Reforms” in November 2013—the first time military reform had its own section in such a document—and articulated at a conference Xi held that December, this transformation is described by the PLA as “Chairman Xi’s important expositions on deepening defense and military reform.”18 It is facilitated by high-level PLA corruption investigations that Xi has arguably used to help engineer a usable crisis and mandate for change. According to one Chinese media report, the ground forces will be downsized further and receive their own headquarters to become a subordinate service, while the Navy and Air Force will be expanded.19 The PLAN stands to gain the most as leadership, command systems, and force structure are apportioned more evenly among the services to support integrated joint operations adequate to prevail in nearby maritime crises and fight and win “local war under informatized conditions” there—the types of high-end contingencies currently of greatest concern to China’s leadership. Xi’s “China Military Dream” represents the latest layer of traditional PRC foreign policy and defense strategy, centered on the principal goal of regime survival via upholding territorial integrity and sovereignty, maintenance of a peaceful regional and international security environment, continued economic development, and enhancing prestige. China’s traditional military policy has been to focus on a strict hierarchy of security interests. Throughout its history, regime continuity has come first, followed by domestic legitimacy and stability in core Han-dominated areas. In different periods, homeland defense has included more broadly a collection of Han-minority or -plurality borderlands and national borders. Since the end of the Cold War, success in the aforementioned areas has enabled an additional layer of focus: Taiwan and other unresolved island and maritime claims in the Near Seas. Accordingly, China has developed a broad array of potent asymmetric weapons systems that pit China’s strengths against adversaries’ weaknesses, enabling China to exploit its formidable geography and resources to further its Near Seas claims, and their immediate approaches (within about 1,000-1,500 km from the mainland). The best single place to get a sense of the direction of the PLA under Xi is China’s 2015 Defense White Paper, its first-ever on “strategy.”21 It reveals determination to consolidate and render more effective the aforementioned capabilities, while addressing new realities and continuing great power military development with relevance to power projection overseas. More incremental than revolutionary, it nevertheless contains Xi’s signature approach: pushing forward decisively to further clear priorities. The document stresses increasingly complex, far-ranging interests: “the national security issues facing China encompass far more subjects, extend over a greater range, and cover a longer time span that at any time in the country’s history.” It places unprecedented emphasis on “safeguard[ing] the security of China’s overseas interests.” China’s overseas citizens, businesses, assets, and investments are proliferating, particularly in the unstable areas to which they gravitate for lack of Western competition. Resource access abroad is essential to fueling China’s rapidly growing economy, still manufacturing-focused and energy-intensive. This will be particularly challenging in an era of growing resource demands, access and pricing instability, and even growing scarcity in some cases. To realize its “strong military dream” in a new era of revolution in military affairs and strategic contention, Xi asserts, China must exploit a rare window of opportunity to seize the strategic high ground in the ocean depths, outer and cyber space, the poles, and other emerging areas.22 The paper stipulates progress in four “critical domains,” namely “seas and oceans, outer space, cyberspace, and nuclear.” Additionally, China must keep pace with accelerated worldwide use of “long-range, precise, smart, stealthy and unmanned weapons.” Concordant with Xi’s priorities, the new “basic point” of China’s “military strategic guideline” is “winning informationized local wars” (打赢信息化局部战争). Looking forward, Xi is determined to add growing power projection capabilities as a secondary supplement to Near Seas presence and counter-intervention capabilities. As for that core mission, “The PLAN will continue to organize and perform regular combat readiness patrols and maintain a military presence in relevant sea areas.” Simultaneously, however, the PLAN will move from “Near Seas defense” to “the combination of ‘Near Seas defense’ and ‘Far Seas protection’” (远海护卫). This last phrase’s first-ever mention in an official document suggests a secondary, but growing, effort to develop limited blue water naval capabilities. The two most important dates in Xi’s timeline for military modernization are likely the PLA’s centenary in 2021 and the conclusion of his tenure in office as chairman of the party Central Military Commission (CMC) the following year. Two major types of Chinese capabilities are most important to scenarios involving neighboring nations in peacetime and the United States in crisis or wartime. “Navy” forces—the PLAN, CCG, and Maritime Militia—maximize peacetime presence and influence in the Near Seas. PLAN and PLA Air Force (PLAAF) aircraft likewise pursue presence in the airspace above. “Anti-navy” forces—missiles and aircraft, primarily land-based, but also including missiles on ships and submarines—represent China’s capabilities for deterrence in peacetime and counter-intervention in crisis or wartime. As for civil maritime forces, the disparity is even greater. Still growing fast, China’s Coast Guard vessels (205) already outnumber its neighbors’ combined 147. China has 129 500-1,000-ton coast guard vessels to its neighbors’ 84. Here it bears mention that China’s Maritime Militia, to which only Vietnam has a true equivalent in the region, will soon have 29 500-ton steel-hull trawlers in its Tanmen branch alone. Meanwhile, the USCG lacks resources or mission to be a significant Near Seas factor. These numerical advantages—which are poised to increase substantially by 2022—give China unmatched presence, and considerable influence, in the Near Seas. Wartime capabilities require far greater sophistication than “flooding the zone” with numerous low-tech vessels, and here the United States and Japan retain considerable advantages. Nevertheless, PLAN vessels display growing multi-mission emphasis and capability. Whereas previously anti-surface warfare (ASuW) focus eclipsed competing priorities, now growing effort is devoted to anti-air warfare (AAW)—a pronounced feature of Luyang-II and -III destroyers and Jiangkai-II frigates. Over-the-horizon (OTH) targeting necessary to support ASuW, also increasingly emphasized, is supported by a growing reconnaissance strike complex with space-, air-, ground-, and sea-based components. Under Xi, geography will continue to shape PLA capabilities. Even as the PLAN further exceeds the USN numerically, it will lag significantly in big-ticket platforms and power projection capability. By 2020, China will only have 6-9 nuclear-powered attack submarines and 1-2 aircraft carriers, far fewer than the United States.30 The biggest technological factor is enduring weakness in propulsion (aircraft and ship engines) that cannot be rapidly ameliorated. And China will likely have made considerably less progress in the “software” behind this hardware: organization, training, and operational experience. For the Near Seas missions likely prioritized throughout Xi’s tenure, however, China has many work-arounds to compensate for limitations in both hardware and software. Even capitalizing on these core strengths for core missions requires further effort. Accordingly, Xi is pushing the PLA to become more efficient and effective at prosecuting the “Local Wars under Modern Informatized Conditions” for which it was previously charged to prepare. Complexity and realism of training, particularly with respect to joint operations, remains uncertain, though it has improved significantly in recent years and is now emphasized by Xi himself. Xi is the first paramount leader to stress realistic training so strongly and specifically.31 Xi is also prioritizing PLA funding, which has begun to exceed GDP growth—a divergence that could grow if the economy slows further. Xi’s reforms imply a big win for the PLAN, a significant boost for the PLAAF, continued support for the already-flourishing Second Artillery Force, and a major loss for the ground forces. Increasing emphasis on the roles, missions, and capabilities of these organizations vis-à-vis the ground forces enhances potential for another challenge long bedeviling advanced militaries: inter-service rivalry. Additionally, there is the issue of how well China can coordinate its forces and their assets even at their most cooperative. To detect, report, and direct activities over the Pacific and Indian oceans China is developing an increasingly complete, integrated command, control, communications, computers, intelligence, surveillance, and reconnaissance (C4ISR) network. Ground- and sea-based ISR systems can provide persistent, accurate surveillance with massive data transmission to ~185 km from shore, but farther afield, patrol ships and air- and –space-based systems are required despite their intermittent coverage. Yet, coordinating forces and operations remains one of China’s greatest weaknesses. Its parallel party-state system is designed specifically to preserve party control, as well as medium- and medium-long-term implementation of top policy priorities—necessarily at the expense of real-time crisis management, decision-making, and joint military operations. Given the party’s continued determination to preserve this system’s core aspects, radical improvements are unlikely. Fortunately for China, for the homeland and Near Seas-area contingencies of greatest concern, many workarounds are available, including stopgap measures to reduce need for joint force coordination by segregating forces by time and space. Satellite communications has already improved significantly, driven by impressive launch rates of late. This is part of a C4ISR infrastructure renaissance of impressive scope and rapidity. More broadly, to increase its comprehensive capabilities, as stipulated in the 2015 Defense White Paper, let alone to become capable of long-distance, high-intensity power projection, the PLA will have to effect a broader transformation from traditional “active defense” (TADS) with its “isolated information islands” to a more comprehensive maneuver warfare based on “information systems-based system of systems operations (ISSSO)” akin to US pursuit of net-centric warfare to support more sophisticated operations.34 Under the PLAN’s unifying concept of balanced development, aircraft carriers are envisioned to “form maritime operations systems” (形成海上作战体系) to fill strategic space as part of a move toward a joint, integrated, information-based system of systems to support “information systems-based systems operations” (基于信息系统的体系作战). Variable-distance operations are emphasized in multiple spatial dimensions, not only surface and subsurface but also air and space.35 While Western strategists would view such developments—to the extent that they prove successful in practice—as simply part of the integrated approach that the United States and other advanced navies have long pursued,36 this would represent a great leap forward for the PLA. Xi is on track to realize much of his dream of a strong country with a strong military. He will likely leave as his legacy as commander-in-chief a PLA with the following characteristics. During his decade in office, it will have grown far more rapidly in quality than quantity. It will give China unprecedented options for pursuing disputed claims in the Near Seas. There, it will coordinate closely with a consolidated CCG and Maritime Militia to maximize peacetime progress in furthering China’s “maritime rights and interests.” China’s military will have learned constantly from, and cooperated increasingly with, foreign militaries—particularly beyond the disputed areas of its immediate region. The PLA will have substantially strengthened power projection capabilities and deployed more forces on increasingly-diverse, distant peacetime missions; but it will still lack substantial combat capacity against a great power military overseas. The PLA will cost ever more to man, train, and equip—factors that will progressively impose important choices, particularly for Xi’s successor. For now, however, Xi is poised to preside over continued rapid development and the deployment of manifold new, impressive systems: an enviable position. We may come to see Xi’s era as a burst of activity when the PLA reached the apogee of its capabilities relative to its American counterpart’s, before competing domestic priorities diffused focus and funding. If so, this could be one of the most challenging periods in Sino-American military relations. What few impressions and understandings Xi and Obama reached in their recent meeting may thus count disproportionately as the two enter a new era of managing tensions, and possible crises, in the Near Seas. 1. Xi frequently invokes this phrase during military-related events. For a CCTV page devoted to this topic, see http://news.cntv.cn/special/xddtjs/index.shtml. 2. Cheng Li, “Xi Jinping’s Inner Circle (Part 1: The Shaanxi Gang),” China Leadership Monitor 43 (Spring 2014): 15, http://www.hoover.org/sites/default/files/uploads/documents/CLM43CL.pdf. 3. Nan Li, “Top Leaders and the PLA: The Different Styles of Jiang, Hu, and Xi,” in Phillip Saunders and Andrew Scobell, eds., PLA Influence on China’s National Security Policymaking (Stanford, CA: Stanford University Press, 2015), 134. 4. “China is Here for Peace,” Remarks by H.E. Xi Jinping President of the People’s Republic of China at the United Nations Peacekeeping Summit, New York, September 28, 2015, http://www.fmprc.gov.cn/mfa_eng/zxxx_662805/t1302562.shtml. 5. White House, “Remarks by President Obama and President Xi of the People’s Republic of China in Joint Press Conference,” September 25, 2015, https://www.whitehouse.gov/the-press-office/2015/09/25/remarks-president-obama-and-president-xi-peoples-republic-china-joint. 6. “China Not to Pursue Militarization of Nansha Islands in South China Sea: Xi,” Xinhua, September 26, 2015, http://news.xinhuanet.com/english/2015-09/26/c_134660968.htm. 7. US Department of Defense, “Supplement to the Memorandum of Understanding on the Rules of Behavior for Safety of Air and Maritime Encounters Between the Department of Defense of the United States of American and the Ministry of National Defense of the People’s Republic of China,” September 15, 2015, http://www.defense.gov/Portals/1/Documents/pubs/US-CHINA_AIR_ENCOUNTERS_ANNEX_SEP_2015.pdf. 8. US Department of Defense, “Military Crisis Notification Mechanism for Use of the Defense Telephone Link,” September 2015, http://www.defense.gov/Portals/1/Documents/pubs/US-CHINA_CRISIS_COMMUNICATIONS_ANNEX_SEP_2015.pdf. 9. US Department of Defense, “Memorandum of Understanding Between the Department of Defense of the United States of America and the Ministry of National Defense of the People’s Republic of China Regarding the Rules of Behavior for Safety of Air and Maritime Encounters,” http://www.defense.gov/pubs/141112_MemorandumOfUnderstandingRegardingRules.pdf. 10. US Department of Defense, “Memorandum of Understanding Between the United States of America Department of Defense and the People’s Republic of China Ministry of National Defense on Notification of Major Military Activities Confidence-Building Measures Mechanism,” http://www.defense.gov/pubs/141112_MemorandumOfUnderstandingOnNotification.pdf. 11. For detailed analysis, see Peter Dutton and Andrew S. Erickson, “When Eagle Meets Dragon: Managing Risk in Maritime East Asia,” RealClearDefense, March 25, 2015, http://www.realcleardefense.com/articles/2015/03/25/when_eagle_meets_dragon_managing_risk_in_maritime_east_asia_107802.html. 12. White House, “FACT SHEET: President Xi Jinping’s State Visit to the United States,” September 25, 2015, https://www.whitehouse.gov/the-press-office/2015/09/25/fact-sheet-president-xi-jinpings-state-visit-united-states. 14. Phil Stewart, “US, China Agree on Rules for Air-To-Air Military Encounters,” Reuters, September 25, 2015, http://www.reuters.com/article/2015/09/25/us-usa-china-pentagon-idUSKCN0RP1X520150925. 15. Dan De Luce and Paul Mcleary, “In South China Sea, a Tougher US Stance,” Foreign Policy, October 2, 2015, http://foreignpolicy.com/2015/10/02/in-south-china-sea-a-tougher-u-s-stance/. 16. Andrew S. Erickson, “Showtime: China Reveals Two ‘Carrier-Killer’ Missiles,” The National Interest, September 3, 2015, http://www.andrewerickson.com/2015/09/showtime-china-reveals-two-carrier-killer-missiles/. 17. Minnie Chan, “China to Drastically Overhaul Its People’s Liberation Army in ‘Ambitious’ Plan to Build Modern Fighting Force on Par with West,” South China Morning Post, September 2, 2015. 18. 马德宝, “深化国防和军队改革的科学指南,” 解放军报, www.81.cn, August 28, 2015, http://www.81.cn/jmywyl/2015-08/28/content_6653068.htm. 19. 曝中共军方阅兵后大改革: 改后似美军,” Duowei Xinwen, August 28, 2015, http://china.dwnews.com/news/2015-08-28/59677757.html. 20. Andrew S. Erickson, “Sweeping Change in China’s Military: Xi’s PLA Restructuring,” China Real Time Report, The Wall Street Journal, September 2, 2015, http://blogs.wsj.com/chinarealtime/2015/09/02/sweeping-change-in-chinas-military-xis-pla-restructuring/. 21. Unless otherwise specified, quotes in this section are from 中国的军事战略 (Beijing: 中华人民共和国国务院新闻办公室, May 2015), www.81.cn, http://www.81.cn/dblj/2015-05/26/content_6507373.htm. 23. Ryan Martinson, “Jinglue Haiyang: The Naval Implications of Xi Jinping’s New Strategic Concept,” China Brief, January 9, 2015, http://www.jamestown.org/programs/chinabrief/single/?tx_ttnews%5Btt_news%5D=43375&tx_ttnews%5BbackPid%5D=25&cHash=79fbe1663487bd383097fcbe52a2f530#.VMZ0I4rF8me. 24. Data in this and the next paragraph are from The PLA Navy: New Capabilities and Missions for the 21st Century (Suitland, MD: Office of Naval Intelligence, April 9, 2015), 11-12, 41, http://www.oni.navy.mil/Intelligence_Community/china_media/2015_PLA_NAVY_PUB_Interactive.pdf. 26. Andrew S. Erickson, Personal summary of discussion at “China’s Naval Shipbuilding: Progress and Challenges” (conference held by the China Maritime Studies Institute at the US Naval War College, Newport, RI, May 19-20, 2015), http://www.andrewerickson.com/2015/07/quick-look-report-on-cmsi-conference-chinas-naval-shipbuilding-progress-and-challenges/. 30. Craig Murray, Andrew Berglund, and Kimberly Hsu, “China’s Naval Modernization and Implications for the United States,” US-China Economic and Security Review Commission Staff Research Backgrounder, August 26, 2013, http://origin.www.uscc.gov/sites/default/files/Research/Backgrounder_China’s%20Naval%20Modernization%20and%20Implications%20for%20the%20United%20States.pdf. 31. “Xi Jinping Inspects Guangzhou Military Region, Emphasizes Diligently Fortifying National Defense,” CNTV, December 13, 2012, http://v.chinamil.com.cn/news/2012-12/13/content_5140199.htm. 34. Nan Li, “China’s Evolving Naval Strategy and Capabilities in the Hu Jintao Era,” in Roy Kamphausen, David Lai, and Travis Tanner, eds., Assessing the People’s Liberation Army in the Hu Jintao Era (Carlisle, PA: Army War College, 2014), 257-300. 35. See, for example, 林东, “基于信息系统的军事力量体系的发展理念” 中国军事科学, no. 1 (2011): 22; 李大鹏, 谭乐祖; 海军航空工程学院; 杨根源, 海军信息化专家咨询委员会; “预警机支援下舰艇编队网络化协同反导研究” 现代防御技术 41, no. 1 (February 2013): 9-14. 36. For Chinese studying of US carrier operations history for best-practice examples, see 赵广志李大光, “航母战斗群的编成与运用” 国防科技工业, no. 10 (2012): 20-22.